Here is a copy of a ticket stub from the show. It was definitely NOT at Hofheinz Pavillion. It was at Sam Houston Coliseum. I was on the 4th row for that show and it was at the Sam Houston Coliseum. Still have my ticket stub. It was a great show! This concert was not at Hofheinz Pavilion - but was at the Houston Coliseum (that should be corrected). Yes was the backup band to Jethro Tull on their Aqualung tour. Like most of the people who came there to see Tull, I had never even heard of Yes until they stepped out on stage. As much as I loved Jethro Tull at the time, and as good as they were live (and anyone who's seen Tull live knows how good they can be), amazingly I went home with Yes songs playing in my head. I immediately went out and got The Yes Album, and it's been an incredible, fantastic voyage ever since. Great show! I don't think I've seen a better concert since. David M, it WAS at Hofheinz. 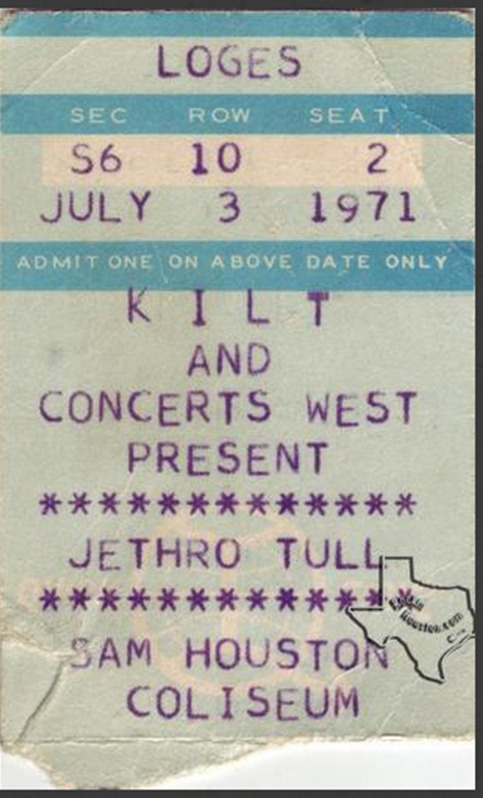 my very first big concert to attend.i was 14 years old and i had the time of my life.both yes and jethro tull were excellant and became fans of both of them.the concert was played at the sam houston colliseum not hofheinz pavilion.i have seen every yes concert that has come to houston tx. since. please come back and play again ,you forgot houston on your last tour.thanks for the great music. This was one of the first concerts that I saw, and It was completely unforgettable. I will cherish those fragile memories for all time.